Best supporting K-9 in a work of crime fiction. The little beagle, Molly, steals the show in the first SAM DELAND CRIME NOVEL, SINK RATE (due for release next month), but Dutch has his moments. The black German shepherd worms his way into our hero’s heart at about the same time Dutch’s pretty lady owner does. It’s a two-fer. Dutch’s agent negotiated a larger part in the third book in the series, SIDE SLIP, but you’ll have to wait until next spring for the unveil. And yes, the author has a big soft spot for this guy. He is still missed. You write what you know. There weren’t any other cars in the lot when he parked at the mini-mart. He went through the door, but still didn’t see her. He walked past the counter and looked around at the back of the store. No one there. He could hear the sound of a truck engine coming from the rear. He went through a storage room and saw an open double door leading out to a loading dock. Eileen was swinging around behind a hand truck loaded with fifty pound bags she was wheeling from the rear of an enclosed truck that was backed up to the dock. Sam caught movement out of the corner of his eye to his left and turned his head. His eyes locked with the biggest, blackest German shepherd he had ever seen, lying at the end of the dock five feet from him. The dog looked quickly at Eileen and back to Sam. Sam stood very still and thought, what am I going to do if he comes, hit him with these daisies? The bouquet was clinched in his gun hand and the little card was in his left. In one fluid motion the shepherd uncurled from his spot and was up facing Sam. “Dutch, lay down!” Eileen was standing right next to Sam. The black dog dropped like a sack of potatoes. “He won’t hurt you, Sam. Really, he’s a big baby,” Eileen took Sam by the arm and walked him over to where the dog was. Sam kneeled down and looked right at him. 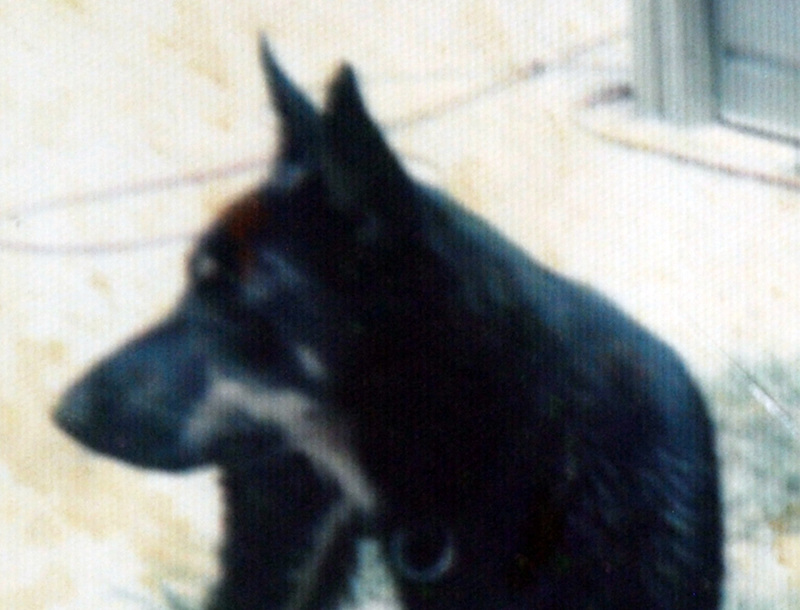 The two tan dots over his eyes bounced up and down as the dog looked at Sam and then Eileen. Sam offered the dog the back of his hand and was rewarded with a wet sniff. Sam gently rolled his hand around and caught the dog’s right ear and scratched it at the base. The dog moved into Sam’s hand and cocked his head to soak up the attention. “He’s a real beauty. How’s that, Dutch, you like to have your ears rubbed?” the hundred pound lug rolled over on his back so Sam could scratch his tummy and wagged his tail so hard it thumped against the wood floor. “Oh, these are for you, to say thanks for helping out yesterday,” Sam handed Eileen the flowers and the card and left Dutch wondering what happened to his tummy rub. This entry was posted in Author, crime, crime fiction, detective fiction, dogs, fiction, law enforcement, mystery, novel, police, publishing, SINK RATE, suspense, writing and tagged author, crime, crime fiction, detective fiction, dogs, fiction, law enforcement, mystery, novel, police, publishing, SINK RATE, suspense, Writing. Bookmark the permalink. “You write what you know.” Yep. Looking forward to your book coming out next month.